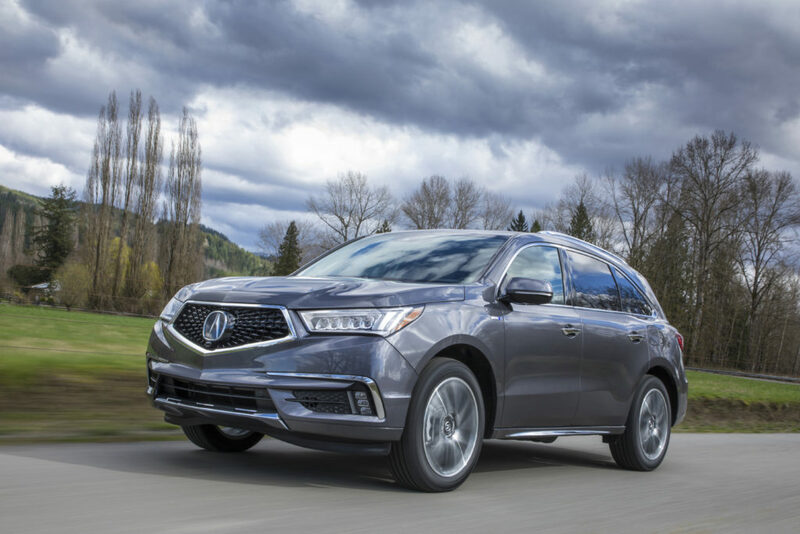 Acura has upped the ante, literally, with its 2019 MDX Sport Hybrid – adding $700 to the base Technology model’s starting price and boosting the top-of-line Advanced model by $1,400. That puts the starting price for Acura’s hybrid SUV at $53,795, jumping to $60,545 for the Advanced model with its deluxe interior. The 2019 MDX Sport Hybrid keeps its predecessor’s 3.0-liter , 257-horsepower gas engine, “SH-AWD” (super-handling, all-wheel drive) system, 7-speed dual-clutch automatic transmission and three-motor hybrid drive. The combined package puts out 321 hp and 289 lb-ft of torque. The 2019 hybrid also keeps the 2018 models’ EPA fuel economy rating of 26 mpg city, 27 mpg highway and 27 mpg combined. That’s almost 11 percent more power and 37 percent better fuel economy than the comparably equipped standard gasoline-only MDX with its 3.5-liter, 290-horsepower engine. And both hybrid trim levels get adaptive suspension dampers as standard equipment – exclusive in the MDX lineup. All that comes at just a $1,500 premium over the standard MDX Technology with SH-AWD; $1,905 more than the Advanced all-wheel drive standard model. The 2019 Acura MDX Sport Hybrid, a midsize, luxury SUV with three-row seating, is slated to begin arriving at dealer showrooms this week. Both MDX hybrid models get standard LED headlights, 20-inch wheels, leather upholstery, keyless ignition, a power moonroof, LED headlights, power-adjustable heated front seats, multi-zone climate control, four USB ports, an eight-speaker audio system, and an infotainment system with an 8.0-inch display that sits atop a 7.0-inch touchscreen. Standard safety equipment includes forward collision warning and automatic braking, blind-spot monitors with rear cross-traffic alert, lane departure alert, lane keeping control and adaptive cruise control. The Advanced model adds idle stop-start engine technology, a surround-view camera and a 6-passenger seating layout with cooled front seats, 2nd-row captain’s chairs and a wood-trimmed 2nd-row console in place of the Technology model’s center bench seat and 7-passenger capacity.